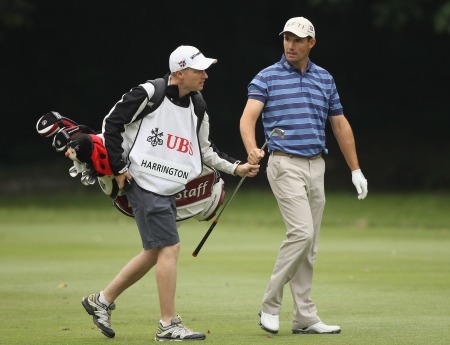 It’s a big ‘if’ of course, as Harrington seeks his first European Tour victory for nearly four years. Yet while record crowds of 30,721 stoically withstood horrific weather conditions that battered the field and allowed just 13 of the 71 survivors break par yesterday, Harrington showed just why he’s a three time major winner when he came back from an unsteady start to card a level par 72 and go into today’s final round just two strokes behind the leaders. Welshman Jamie Donaldson, who is bidding for his first tour victory at the 245th attempt, coped better than most when he carded a three under par 69 in southwest winds gusting up to 25 mph to forge a one-stroke lead over England’s Anthony Wall on 12 under par. Out on his own. Leader Jamie Donaldson birdies the 16th. Photo Jenny Matthews/www.golffile.ieWall, who is staying in a caravan near the famed links this week, carded a sublime 67 to raise his hopes of a second tour success of the five star variety in his 401st event. Yet Harrington stands out like a colossus on the leaderboard as he shares third place with England’s Mark Foster, who has just one win from his 306 European Tour starts, on 10 under. The fear factor should be tremendous for lesser the lights. But Harrington knows he has his enough problems of his own to deal with as he bids to record a victory that would haul him back into the world’s top-50 for the first time since May 2011 and give him a fighting chance of winning a seventh Ryder Cup cap in September. The 40-year old world number 69, got off to a shaky start in driving wind and rain when he bogeyed the fourth and seventh and then followed a birdie at the ninth with a bogey at the 13th. But as the weather abated, he got a boost when he cracked a glorious, cut three-iron to within 10 feet of the flag from 201 yards at the par-three 14th - Calamity - and holed the putt. It proved to be the turning point in his round and, who knows, possibly in the tournament. Buoyed by that success, Harrington birdied the par-five 17th to get back to parity for the day but he knows that having a big name is no guarantee of victory on Sunday. Rory McIlroy sets off in the worst of the weather. Photo Jenny Matthews/www.golffile.ieDonaldson knows that Harrington is lurking on his shoulder but he confessed that his biggest rival today is himself as he tries to get over the line for the first time in a European Tour event. England’s Paul Waring, back in action after more than a year on the sidelines with a serious wrist injury, is three shots off the pace on nine under after a 73 with Spain’s Rafael Cabrera Bello (70) a shot further back on eight under alongside Scot Craig Lee (67), Dane Thorbjorn Olesen (66) and Paraguay’s Fabrizio Zanotti (68). Anthony Wall. 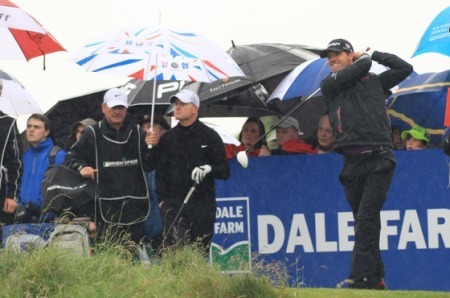 Photo Fran Caffrey www.golffile.ieWith fairer weather expected today, world number two Rory McIlroy could be a threat as he lurks six shots off the pace on six under after a battling 71 yesterday. The Holywood star is looking for a 64 at worst as he chases his first Irish Open success and he was pleased to grind out a score yesterday after admitting this week that he has a tendency to throw in the towel when things aren’t going well. With a new driver giving him an extra 15 yards off the tee this week, McIlroy believes he can go low on a course where he fired a course record 61 at a 16-year old in 2005. Portrush’s Graeme McDowell is eight shots off the pace after a rain-lashed 73 but he believes that the event, which is set to return to Carton House near Dubliner next June, must come back to the Causeway Coast soon. “Absolutely,” McDowell said. “It must come back. It will come back and we’ll be 100 per cent behind that. McDowell knew he needed a low third round to catch the leaders but a double bogey six at the tough seventh derailed his hopes. And while he played the remaining holes in one under, he confessed that it’s been great preparation for the Open at Royal Lytham in three weeks’ time. McDowell said: “I wanted to play my way back into the tournament this morning but conditions didn’t really allow me to do so. “I don’t think I’ve ever played this course in much tougher conditions. Well, that’s probably a little bit of an exaggeration. But it was tough out there. “That said, it’s always good to go out and see how you can deal with conditions like today because in three weeks time we’ve got the British Open and it could mean a lot on Sunday afternoon if you could handle these conditions. Michael Hoey eagled the second it after going out in two under, he bogeyed the 11th and then dropped three shots in his last four holes, finishing with four successive fives for a 74 that left him seven behind on fiv under. Darren Clarke’s hopes of making a move were dashed by a double bogey seven at the 17th, just as the weather started to improve. “The carry to the 17th fairway is only 250 yards but we couldn’t make it,” said Clarke, who started birdie-eagle but shot a 73 to fall back to three under. “I went left and could only move an eight iron about 80 yards. Clarke and Shane Lowry could only laugh after getting soaked to the skin. The pair got the worst of the weather with Lowry crashing to a 76 in near constant wind and rain. Clarke felt he had a chance of making a run in tough conditions but his putter let him down as he took 33 putts. He said: “I played really well all day and gave myself loads of chances but lipped out all day. I just couldn’t hole a putt. That’s Portrush in wind and rain. That’s links golf. Paul McGinley was seven under with seven holes to play but dropped six shots in his last six holes for a 76 that left him near the back of the field on one-under. 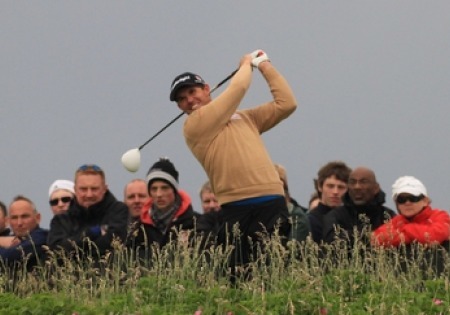 Padraig Harrington is anxious about what lies in store at Royal Portrush. icture Fran Caffrey www.golffile.iePadraig Harrington insists that fatigue will not be a factor as he bids to close a two-stroke deficit on Welshman Jamie Donaldson and claim his second Irish Open title at Royal Portrush today. Padraig Harrington had to eat his words as Jamie Donaldson finished in glorious style to prove it is not so tough to win the Irish Open from the front.